I am talking about an old Sunday School tune: Count your blessings, name them one-by-one. Count your blessings see what God has done. I don't do that often enough. I find myself pointing out negatives all day, behaviors I would like to see changed, and attitudes that need adjusting. But do I sit down and remind myself of all the blessings that God has done in my life? Not often enough. ~ I am so thankful for my husband who: recognizes when he tripped up and apologizes, who is helpful in planning and implementing homeschool reinforcements, who gets up so early every day to provide for us, for the many ways he point these things out to the boys so they also know how to provide for a family, I am so thankful that he continues year after year to attempt to cheer me up by being silly (even though it doesn't always work, he is tenacious). ~ I am thankful for the rich heritage God has given me in generations of Christians to influence my life. Growing up I knew we were different, always running off to some family function at a Grandparent's house, always having supper together as a family, but I didn't realize till an adult what a blessing it was to have that. ~ Finally, I am thankful that God walks with me through this life. There are fears and uncertainties that I don't know how I would handle if I wasn't anchored to a Solid Rock. He knows our future, He provides, He has been faithful in the past when I have been unfaithful, and there is comfort in this. I totally remember that song! Your site looks really nice--I like the redesign. I'm so glad you linked up this week. I always enjoy hearing from you. 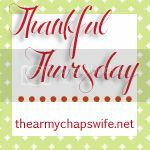 Your thankful list is wonderful!